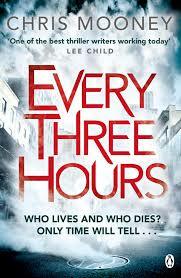 Every Three Hours is the sixth book in the Darby McCormick series by Chris Mooney. Darby is back in Boston with Coop. When she arrives at Boston police station she is confronted by a guy wearing a suicide vest, claiming to have planted several bombs around the city, which he intends to set off every three hours if his demands are not met. I enjoyed this book, it was different from the others in the series, rather than chasing a serial killer she is dealing with a single person threatening the whole of Boston. It was also nice to see Darby's father mentioned again, as I believe a lot of what led Darby to where she is today has to do with her father. As always this book was well written with a great plot and fantastic characters. I have now read the whole series and cannot wait to read more of Chris Mooney's books.